Swindle All The Way is about two escaped thieves prowling around a neighborhood around Christmas time. Their success or failure depends on the players. 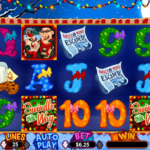 It is a typical slot with 3 rows, 5 reels, and 25 paylines by RealTime Gaming. 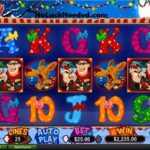 This holiday-themed slot has captured the essence of the winter holidays with relatable audio and nice visuals. The game has been designed in a cartoon-like manner and is quite simple. The symbols are the thieves themselves. When they appear in certain combination, the bonus rounds will be activated. It is also the wild which means you can use this to replace the symbols to create a winning combination. The logo of the game acts as the scatter symbol and is the only one that cannot be replaced by the wild. The scatter pays both ways while the other symbols pay from left to right. Other symbols you will see here are the usual card symbols that have been designed to showcase the Christmas festivities. You will also find a Local Newspaper and a Watch Dog. 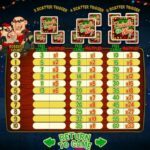 The progressive jackpot can be activated at any time. The wins will be added to your other winnings. The jackpot is reset to $250 for the minor one and to $1,000 for the major one. When three scatters show up on any reels, the bonus feature is unlocked. Here, you have to choose the window where the burglars are hiding. The number of times you will be allowed to choose the window depends on the number of scatters you landed. Apart from this, the number of scatters also determines how many bonus stages will be triggered. With 3 scatters, you will be given 3 games with two more for finding the robbers. Though it is very common theme for slots and the bonuses are not particularly lucrative, the game still has many fans. The animation of the game could be called old-fashioned but the visuals and the audio makes up for it. For another great and engaging game you should consider playing Asgard by RealTime Gaming.